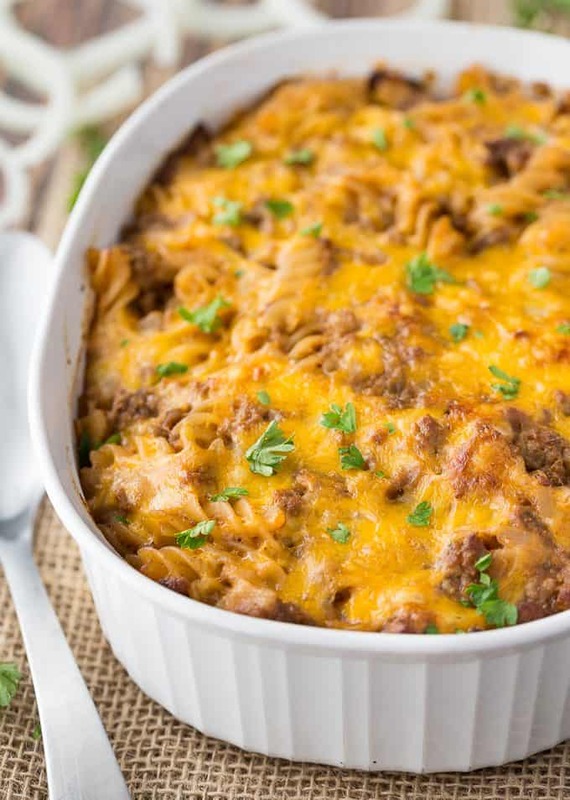 Cheesy BBQ Beef Casserole is going to become an instant family favorite. 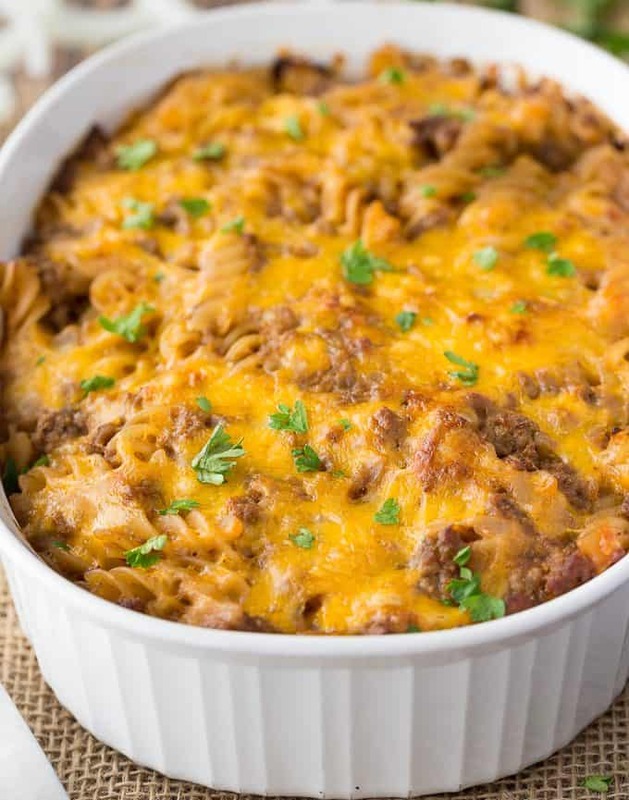 This hearty and comforting dish is cheesy, loaded with BBQ ground beef, and tender pasta. Baked to perfection and great for feeding a crowd! Easy, affordable, and mouthwatering good. Cheesy Barbecue Beef Casserole is what I would call “comfort food”. It’s hearty, satisfying and delicious. It’s also very easy to make. All you need is ground beef, cheese, barbecue sauce, onions, and pasta. For any mom who is limited on time they can spend in the kitchen, this BBQ beef casserole recipe is calling your name. If you say the word casserole I jump right on it! Nothing I love more than a hearty and savory casserole that can be made in no time. 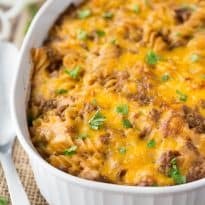 I love the easy prep of this cheesy beef casserole. Once it goes into the oven to bake you can kick your feet up and relax, help kids with homework, or do whatever else is calling your name. This BBQ beef casserole is hearty enough that it doesn’t have to have a side to go along with it. But, if you want to add some more elements to dinner, here are a few of our favorite dishes to pair next to it. To be honest, use whatever brand of barbecue sauce you enjoy the most. I find that the barbecue will be a huge part of the flavor so you want it to be a brand that is quality and you enjoy the taste of it. I really like Kansas City style barbecue sauces but truly any brand you prefer or is on sale try. You can keep your leftovers of the Cheesy BBQ Beef Casserole in the fridge for up to 3 days. Anything after that you will want to toss it out, as it can begin to go bad. I love to warm up the leftovers on the stove. Just toss what you are wanting to eat in the pan and warm it up on low. If the mixture seems a little dry either add in some extra bbq sauce or even a splash of milk. This will return it to a nice and creamy consistency. If you want to warm it up in the oven, then wrap in aluminum foil to prevent it from drying out during the warming up process. Then just heat until warmed through. For this easy casserole, you want to start out by browning your ground beef with the diced onions. While the beef is cooking work on cooking your pasta. Just follow the instructions on the back of the box. Pour your cooked pasta into the pan with cooked beef and onion, and then toss in bbq sauce, and cheeses (reserve 1/2 cup for topping). Mix it all together until nice and blended. Pour into a greased casserole dish, and top with the leftover cheese. Toss in the oven and let it back for around 30-40 minutes. You will want the cheese on top to be lightly golden brown. Allow cooling for a little bit before serving. Yes! Elbow, shells, or whatever type of pasta you have on hand will work. I have not tried it with spaghetti style noodles but I have used a variety of other shorter pasta in the past. I just used what I had in my pantry, so feel free to swap it out. Just aim to use the same amount of pasta that is directed in the recipe card. If you are a fan of the ingredients then give this dish a try. I know for our home we love pasta, so it is always welcome to greet our family at the dinner table. This recipe is a tried and true and I have been making it for years now. There is something about bbq, ground beef, and pasta that just works really well together. 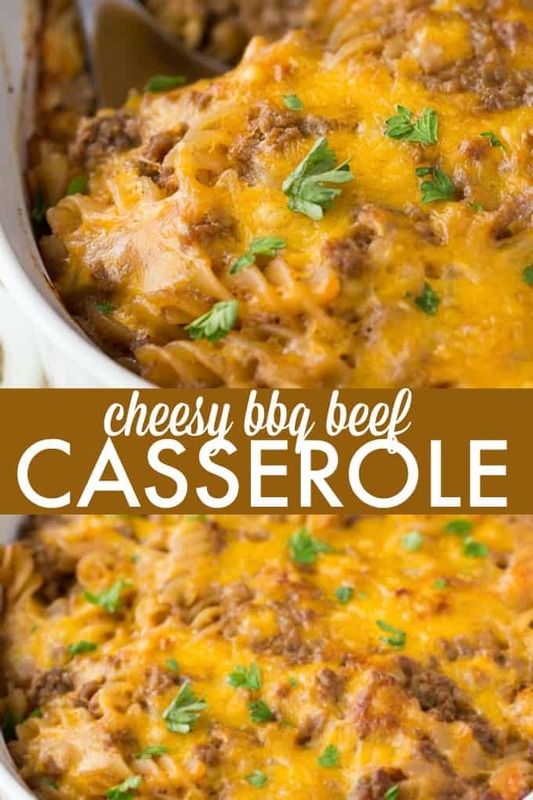 Have you tried a Cheesy BBQ Beef Casserole before? 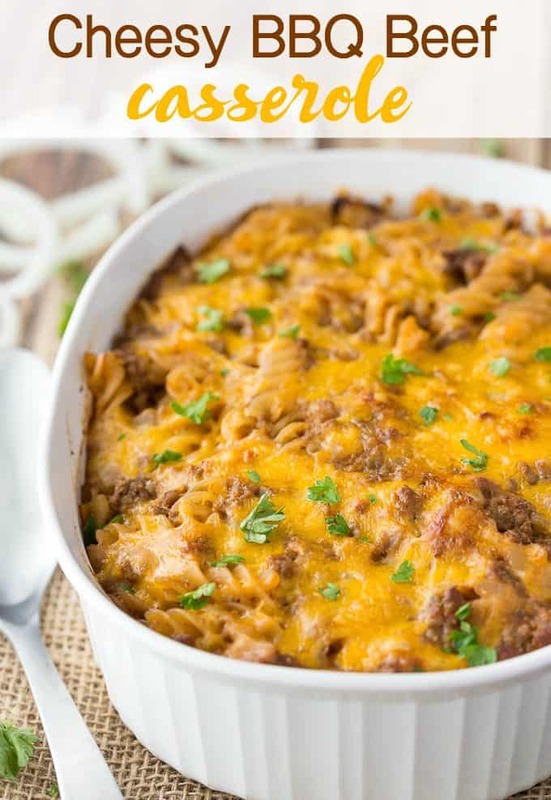 Hearty, meaty, cheesy comfort food! In a skillet, cook beef and onion over medium-high heat for 10 minutes, stirring occasionally. Return drained pasta to the saucepan. Stir in remaining ingredients except 1/2 cup of the cheddar cheese. Spoon into a casserole dish. Sprinkle with remaining 1/2 cup of cheddar cheese. Bake uncovered for 30 to 40 minutes or until hot in the centre. This looks really good! This looks to be something that this kitchen challenged Mom could even serve up! You make the best stuff. OOOOOOOOOOh, that looks so good. Gonna have to try this! Thanks for the recipe! I am SOOO happy to see others buying the % off meat..one of the older ladies at the loblaws said that is all she ever buys from her store (she works the meat dept and often talks to me) and says that the meat is not expired but has quite a few days left BUT most people I know, freeze the meat they buy, they don’t buy fresh meat every day to use!! I love these kinds of dishes – quick to make and filling — and everyone loves them! Thanks for the recipe! Can’t wait to try this. Thanks for the recipe. My goodness that looks so delicious….my teenager would be in cheese heaven. This is a nice comfort food meal that’s very easy to make. Looks good. Think this is dinner tonight. Only cheese I have is cheddar so I will double it. Thanks for the idea. The print function is not working. We tried this the other night and it was so good, thanks for sharing! Trying this tonight was looking for ideas…same old stuff all the time, this looks interesting! Looks delicious! You post so many great recipes! This looks like an awesome weeknight meal! I need to add this to the menu.. soon! My guys’ favorite….requested often, and never any leftovers! I love this dish. I am going to try it with shredded beef. Thanks for the recipe. This would be great on a cold day like today! Thanks for sharing it on Funtastic Friday! I love this casserole! Thanks so much for sharing your awesome post with us at Full Plate Thursday. Wishing you a fantastic 2017! Looks absolutely delish, a perfect family favorite meal! Thanks for sharing at Merry Monday, I hope you’ll link up again!